Bob Baldwin is one of the top five keyboardists of smooth jazz. In my review of Newurbanjazz.com I sketched up his long way to success. Summarized: A strong light casts a deep shadow. But Bob always looks straight forward to the summit. Logically he focused now on the music of Michael Jackson. The story of Michael Jackson is told and the best way to remember his work is to create a cover album of his greatest hits. Pianist Bob Baldwin is joined on some of the tracks by Ron Jenkins (bass), and Buddy Williams (drums). The list of guest-musicians encompasses Ragan Whiteside (flute), Steve Oliver (guitar), Armando Marcal (percussion, vocals), Joey Summerville (trumpet), Chieli Minucci (guitars), Tony Clarke (percussion), Chuck Loeb (guitar) and Dennis Johnson (drums, percussion). Michael released Bad in 1987 selling over 30 millions copies worldwide. Bob Baldwin's rendition is a exquisite grafting of the melody with a jazzy approach. Icing of the cake is Ragan Whiteside's flute solo. Human Nature was produced by Quincey Jones for Michael's mega-seller album Thriller (1982). Written by John Bettis and composed by Steve Porcaro of Toto, the song has evidently more substance as the other songs of the album and really fits into Bob Baldwin's collection. Bob can fully expand his mastership on piano. The Girl is Mine featured in the original version Paul McCartney. Bob Baldwin transfers the melody in his own jazz arcadia. Stevie Wonder wrote I Can't Help It for Michael Jackson's album Off The Wall. On a concert in Montreal in 2009 Stevie says: "We keep his spirit alive for ever." How can that be better done than in Baldwin's elegant piano style. I'll Be There was originally performed by The Jackson 5 (1970) and later covered by Mariah Carey (1992), both went #1 at the charts. A prove for the timeless quality of this song. Anew Bob Baldwin is there to comfort you! Prodigious is Bob's personal written homage to Michael Jackson. Impressively great in size the title underlines Bob's demand and impetus. Leon Ware and Arthur Ross penned I Wanna Be Where You Are for the album I Got To Be There (1971). Bob Baldwin's Latin flavored version already appeared on his album Brazil Chill (2004). The Lady In My Life was one of three songs Rod Temperton wrote for Michael's sensational album Thriller. Bob performs this ballade with great sensibility. Let Me Show You features Joe Summerville on trumpet. Bob lets his piano skills glow. Guitarist Chieli Minucci introduces into the theme of She's Out of My Life, originally from Michaels album Off The Wall (1980). Bob composed Don't Say Goodbye as an interlude to the next song. The vocals have a Pat Metheny flavor. 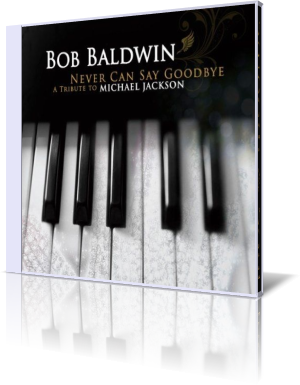 Final tune on Bob Baldwin's tribute album is Never Can Say Goodbye. Bob comments: “I grew up listening to ‘Never Can Say Goodbye’ as a kid and watching the J5 on the Ed Sullivan Show, so he was in the fabric of my musical pop life, in between listening to Duke Ellington and Miles”. This song is a leitmotif of Bob's musical life. He recorded the song for his album Bobbaldwin.com (2000), re-released it for his album Lookin' Back (2009) and now for his newest project. Music is an evolution over time surviving their creators. This tribute is a musical monument of a true legend. Extraordinary, unforgettable melodies interpreted by piano genius Bob Baldwin.